It looks like it was designed by Ken Adam for one of the more opulent Bond films of the 1970s – perhaps as part of Hugo Drax’s jungle lair in Moonraker, or as one of the furnishings inside Stromberg’s undersea base in The Spy Who Loved Me. 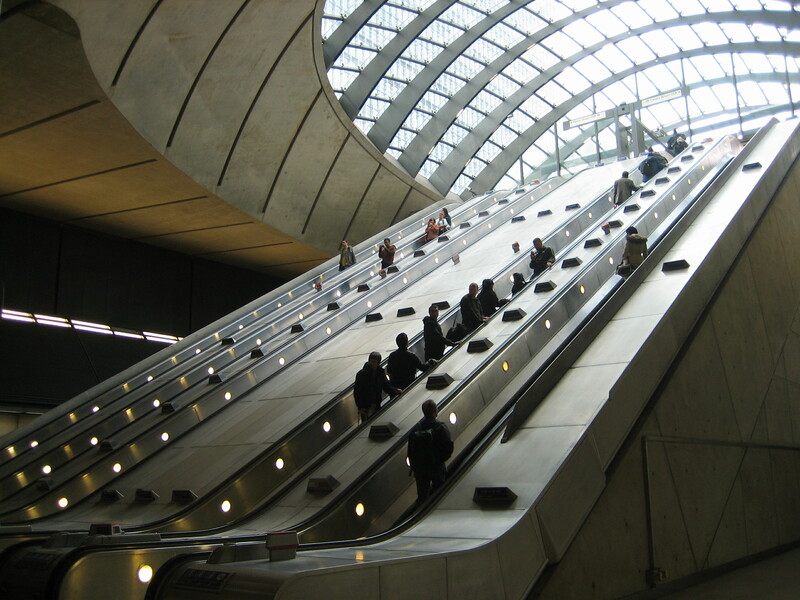 Ken Livingstone pressed the button that first started these escalators whirring, back on 17 September 1999. I’d argue that they hold their own against each and every one of the area’s many elevated landmarks, if not actually edging them by virtue of sliding in graceful solitude underground rather than jostling for attention in the sky. 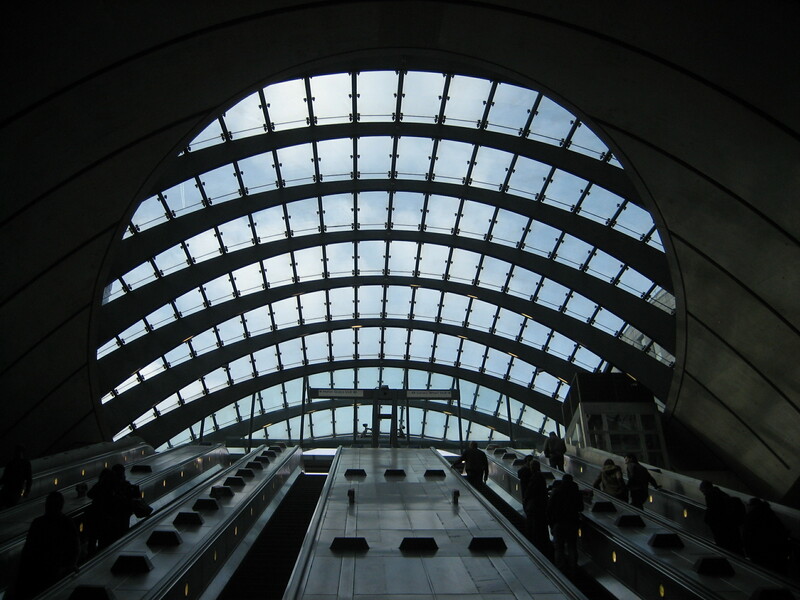 As for the view that greets you when travelling in the opposite direction, as you descend into the immense catacombs of the station itself… that deserves a whole separate entry all to itself. And it was used to great effect in the film 28 Days Later…. I love how different this entrance is. Whilst it looks stunning, apparently this is a nightmare to maintain – each glass pane is different, so if one needs replacing, they have to go to a factory in Denmark (where all the moulds are) and get a new one made. Also, they can only clear the glass at night, and when it is dark you cannot see what needs cleaning! 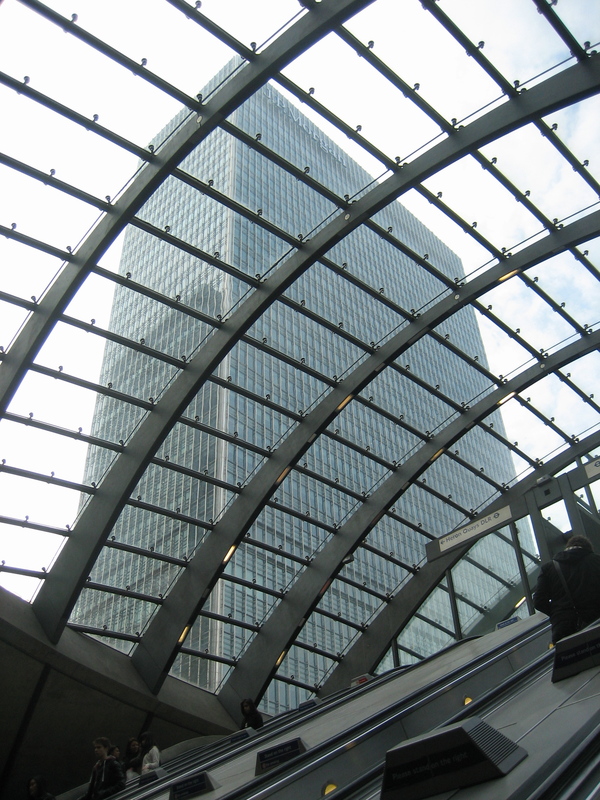 I’ve worked at Canary Wharf for 10 years now and I’m still delighted by this station exit all the time – it’s so glorious. It makes me think of a very modern take on a stairway to heaven. All those men in suits being ferried up to the light on endless steps – or, of course, going the other way… down into hell.